The Spring Framework is an open-source application framework and inversion of control container for the Java platform. The framework's core features can be used by any Java application, but there are extensions for building web applications on top of the Java EE platform. Although the framework does not impose any specific programming model, it has become popular in the Java community as an alternative to, replacement for, or even addition to the Enterprise JavaBeans (EJB) model. 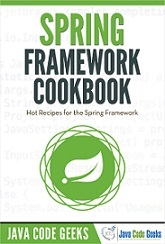 This book provides a compilation of Spring Framework tutorials that will help you kick-start your own programming projects. It covers a wide range of topics, from basic usage and best practices, to specific projects like Boot and Batch. With those straightforward tutorials, you will be able to get your own projects up and running in minimum time. JCGs (Java Code Geeks) is an independent online community focused on creating the ultimate Java to Java developers resource center; targeted at the technical architect, technical team lead (senior developer), project manager and junior developers alike.